Review: After receiving some eager suggestions from commenters, I took a look at Taku Iwasaki’s Bungou Stray Dogs’ Soundtrack 2. Though it might be odd to start with the second disc, it was because I was told it contains the sorts of musical nuggets that I’d enjoy. After listening to the first track on each OST, it’s not hard to see which one would draw me in: OST1’s jarring opener “Good For Nothing” was a bit too out there and doesn’t stand up to “Scarlet Sky’s” sublimely sultry jazzy vocals from OST2. 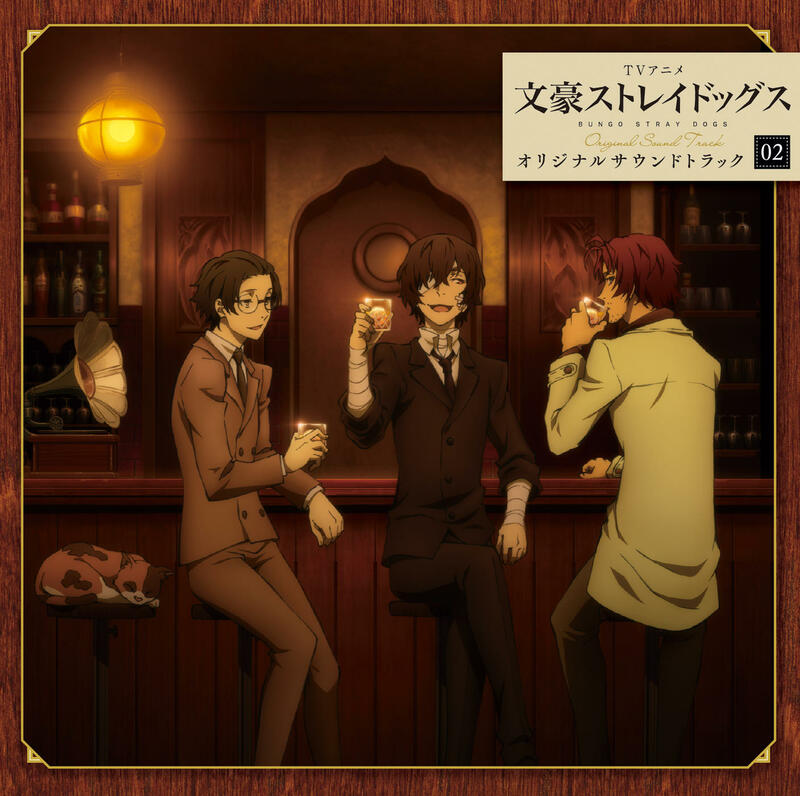 And so, OST2 beckons me on, pulling me in with musical selections that are as diverse as Bungou Stray Dogs’ cast of characters. The album as a whole represents the best amalgam of Iwasaki’s musical direction since he started composing anime music. In it, jazz, opera, piano, orchestra, and even electronica get a chance to shine. And shine they do. As mentioned, the soulful “Scarlet Sky” resonated with me. Its execution, backed by an unmistakable Iwasaki sound, is poignant in its mournfulness as it conveys a strong desire to shuffle off this mortal coil and ascend to the world beyond. The vocals are withdrawn, yet touching, and it is upon the latter emotion in which the album proceeds, when the dreamy, introspective “Kyouchikutou” makes way for “Dormito bene’s” operatic radiance. “Dormito bene” welcomed me with its majestic outpouring and had it just been that, this piece would have been perfectly serviceable. But where it’s marvelous is in how well the emotions shift, with the singer’s passion growing until her singing, and the music, unveil a thunderous magnificence. The intensity that follows keeps me on the edge of my seat as her fiery entreaties unleashes an unforgettably exquisite performance. The vocal goodness doesn’t end there. I found myself enthralled by “Kante’s” ethereal singing. Its deliberate delivery evokes a funeral dirge with a tone that exudes heartache and suffering. Iwasaki also throws in a Buddhist chant with “Ai to Gikou”. No matter how many times I’ve heard the chanting in other albums, the mystical veil it creates sounds disconcerting. Here, I felt like I was bearing witness to some solemn, unearthly ceremony, a feeling further reinforced by a horse whinnying in the background to make it more alien. As good as the songs are, the most notable element of this album is Iwasaki’s return to his old-school melodic style. You can hear that in “Utsu Nikki’s” somber air which imparted a soul-searching atmosphere. The sense of desolation that emerges makes it one of the more entrancing atmospheric pieces on the album. Iwasaki’s style also comes up in “Batalha’s” action music. The emphatic chords that open this piece quickly lead to an interesting duet between the the strings and electric guitar. The strings give it a sense of grandeur while the electric guitar carves out the action, the two working together to create an epic rallying cry. But the pieces that truly define epic on this album come in “Bungo Koukyoukyoku”, a three-part section that, together, yields a flashy heroic narrative. “Dai 1 Bang 1 Gakushou Kumiai” kicks it off with a glorious fanfare that gradually builds up, capturing the inspirational spark that drives the characters to pursue the journey. “Dai 2 Gakushou Kujira” is where calculated plans are unleashed once the electric guitar riffs set it all in motion. Finally, things come to a head in “Dai 3 Gakushou Yokohama”, where we get the payoff. The piece is tense and suspenseful as it conjures up the chaos of the final showdown. The melodic ebbs and swells are fantastic in capturing the flow of battle all the way until the dust settles. With the characters’ struggles behind it, the album ends on a quiet, sincere note. In “Tomo Toifu Mono”, the strings give the piece an air of relaxation through a mellow melody infused with optimism. As the piece continues, the atmosphere it imparts suggests the trials and tribulations the characters endured were worth it. The nagging sense of loneliness dissipates; there’s finally a place to call home and people to call friends. Bungou Stray Dogs’ Soundtrack 2 is nothing if not one of the better Iwasaki scores in recent memory. It contains throwbacks to his older works, mirroring his efforts on Getbackers most with its mix of jazzy melodies, orchestrals, and electronica set amidst a somber backdrop. While it doesn’t have the gravitas of my favorite Iwasaki works (see: the Rurouni Kenshin OVAs), it’s still an enjoyable reprieve from the experimental Iwasaki, at least for a brief moment, until he starts messing around with new genres once more. Quite nice! Shame this soundtrack has received so little attention; it seems nowadays all people know Iwasaki for is that dumb Pillar Men theme from Jojo’s. I really hope he comes up with something amazing for the upcoming Mahouka movie along the lines of that three-part suite. By any chance have you looked at Yoko Kanno’s Naotora? It’s her recent Taiga drama score and a glorious comeback to her orchestral days that we haven’t seen in years. Glad you enjoyed it! I think that as new generations of anime fans go in, the more recent stuff dominate the charts and unless there’s a concerted effort to look at the older Iwasaki, it can quickly fall off the radar. Here’s hoping Mahouka pans out. As for Kanno, I know that one of my writers has been listening to it though I haven’t checked it out myself. I did like her soundtrack to Our Little Sister though. A very quiet, but heartwarming theme that succeeded in bringing tears to my eyes. Mahouka and the Bungou Stray Dogs movie, if everything goes as planned this should be one hell of a year for Iwasaki. I listened through his work on Akame the other day and was pleasantly surprised by how incredibly well-made it was once much of the filler tracks were removed (all of Iwasaki’s soundtracks suffer from terrible music placement). I’ve never seen any other composer (other than possibly Yoko Kanno) be so adventurous with choir and percussion for an anime soundtrack before. Sometimes it even felt like I was listening to Basil Poledouris’s score for Conan. A shame the show was so terrible and the music was ignored by most because of it, I think Akame has some of the best music Iwasaki has ever composed. There’s always a chance that Kanno could return for the next Macross. I’m of two minds because after Delta I would rather just give that franchise have a peaceful rest in the grave already, but Yoko Kanno returning again to score a sci-fi anime is just too exciting.